Unbelievably, we are 5 years old this September! To celebrate this mini-milestone, we are organising a couple of things. First up, we are having a party at the amazing Prince Albert pub in Brighton, where we will have some of the best beer from some of the best UK breweries pouring in the different rooms. Being simple people, we are trying to keep this event simple. It is a small beer festival – there is no entrance fee and no bespoke glass, just great beer being drunk where it should be – in a great pub! To accommodate this influx of beer, we are putting additional bars in the two backrooms and one upstairs. There will be a token system in operation (purchase tokens from the main bar), we will try to homogenise the prices as best as possible. Again, for ease of logistics, almost all of the beers are in keg, the hand-pulls will be serving cask ale as normal, with a couple of guests that we chose. There will be food available at the pub and they will be running a BBQ outside. If that’s not enough, then Trafalgar Street and the North Laine area are awash with varied eateries. Also, don’t forget to visit the legendary Trafalgar Wines – Steve’s been promoting great beer for decades! 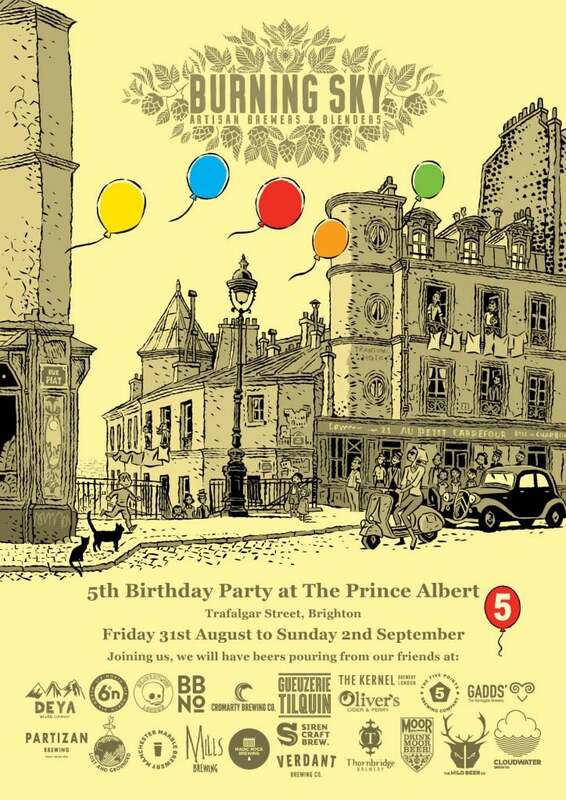 The Albert is open all day but these are THE PARTY TIMES! Friday 31st August: 5pm – close. Saturday 1st September: 3pm – close (this is to avoid the footie). Wild Beer Co. ‘Rooting around Autumn’ 4.6% Autumnal ale with foraged figs and toasted fig leaves. Cloudwater ‘Citra Pale’ 4% Just some of the best low ABV pale ale out there folks, this is no exception – citra led, fermented with London Fog. The Kernel ‘Export Stout’ 7.4% No introduction needed – this stout is an exemplar of the style. Full stop. Verdant ‘Planets don’t twinkle’ (Eldorado) 7.2% Latest in a series of NEIPA from the Cornish outpost. Cromarty ‘Happy Chappy’ 4.1% Superb session pale with US & NZ hops. Lost and Grounded ‘Keller Pils’ 4.8% Best lager in the UK from these people who know a thing or two. Deya ‘Steady Rolling Man’ 5.2% Lovely soft pale with more than it’s fair share of tropical fruit flavours. Magic Rock ‘Cannonball’ 7.4% IPA If you know, then we don’t need to tell you. If you don’t, then you need to! Brew by Numbers ‘Sour Berry Red’ 7.3% A fruity, sour red ale with cranberries, raspberries and lingonberries. Expect a dry fruitiness with an acetic tang. Siren ‘White Tips’ 4.5% Beautiful white IPA, added aromas from orange, lime and grapefruit zest. Marble ‘Guillotine’ 7.1% New Brut IPA from Manc legends, bags of aroma hops in this bone dry IPA. Thornbridge ‘Raspberry Sour’ 7% Seen this before? Didn’t think so. Rare outing of this barrel aged beauty. Partizan ‘Session Stock’ 5.6% Classic riff on a stock ale, after primary fermentation this beer is aged with their own ‘found’ wild strain. Mills Brewing ‘Picture Pot’ 6.3% Barrel fermented with wild house culture, then dry hopped with a deft hand. Moor Brewing ‘Old Freddy Walker’ 7.3% Cult dark ale for the connoisseur, just try it – really, really delicious! Gueuzerie Tilquin ‘Draft Gueuze’ 4.8% Refined and approachable light lemony gueuze from different lambics. Six Degrees North ‘Hop Classic’ 6.6% Dangerously drinkable Belgian style IPA, with floral citrus notes. Five Points ‘Railway Porter’ 4.8% Classic London style porter, smooth with chocolate and coffee aromas. Gadds ‘No. 5’ Spot on Kentish Best Bitter in the Gadd tradition, toffee malt, red berries and fresh hops. Olivers Cider ‘Wild Farmhouse Cider’ 6.5% Rare keg from the best U.K. cider maker. Tart, funky, oak dream! Olivers Cider ‘Hopped Perry’ 5.5% Because there is only one Tom Oliver! Hops, perry…is he mad? Probably – genius also! 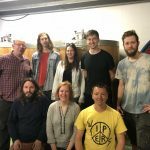 Burning Sky Brewery – We will be mainly situated on the front bar, all beers will be pouring in rotation, (except for Arise, which never leaves the bar. Ever). ‘Arise’ 4.4% Our sessionable pale, always hits the spot. ‘Typically English Day’ Experimental English hops with delicate spicing, creates a quietly contemplative brew. ‘Coolship release No. 1’ 6.8% Sneak preview of our first 100% spontaneously fermented beer, brewed in the lambic tradition. This beer will launch nationally at the end of September. ‘Petite Saison’ 3.5% Barrel aged mixed fermentation saison, lightly dry hopped before packaging. ‘Saison Provision’ 6.5% Foeder aged mixed fermentation saison, our DNA beer and unlike any other – tart, slightly sour and incredibly refreshing. ‘Pretty Mess’ 7% Boundary crossing modern IPA, juicy with plenty of juicy fruit hop aromas. ‘2017 Cuvée’ 7.5% Aged saison/ lambic blend – refined, complex and spritzy. ‘Stock Flanders Blend’ 6.2% Barrel aged homage to the historic link between English and Belgian brewing. ‘Imperial Stout’ 8.5% Complex, yet incredibly smooth imperial aged in oak vats for 18 months. Six Degrees North/ Burning Sky ‘Sea Buckthorn Saison’ 5% made with foraged ingredients. Fork Brewing/ Burning Sky ‘Les Amis du Brassage’ 6.2% One of the last kegs of this crazy mixed fermentation saison, blended with 3 year old lambic. 2 Roads/ Burning Sky ‘The Call’ 5% Juicy sessionable NEIPAish brewed with a mix of UK and US hop varieties.